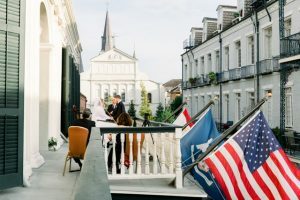 Adam and Leanne Goodwin traveled from the United Kingdom to have their elopement ceremony on the balcony of the Bourbon Orleans in the Fall of 2018. With the backdrop of St. Louis Cathedral and Burbon Street, the couple took their vows, exchanged wedding rings, and were pronounced husband and wife under sunny skies and a perfect Fall temperature. Visitors to New Orleans watched from below the balcony, on the streets cheered and applauded when Rev.Steve pronounced them husband and wife. Rev. Steve Trahan of the New Orleans team of Sensational Ceremonies was honored to work with the couple to create a custom ceremony; rich in love and laughter and also to be a part of their special day. Congratulations to Mr. and Mrs. Adam Goodwin!